Can this Core i7 powered laptop show us quad core has finally come of age? 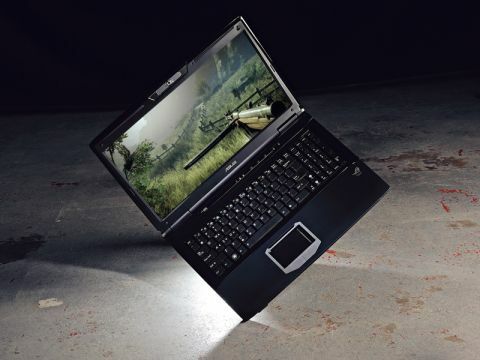 Here we have the new Asus G60J, a gaming laptop with a Intel Core i7 Q820M at it's beating heart. But before we can properly review this laptop we have to dispel some myths surrounding core counts. Add cores and get more performance. It's a simple strategy and one to which AMD and Intel, those perennial rivals in the PC processor business, are fully signed up to. At least, they both are on the desktop PC. Shift your focus to laptop PCs and the situation isn't quite so clear. The arrival of Arrandale, Intel's new 32nm dual-core processor, has really given things a nice shake. It's stupidly quick for a dual core chip. So quick it makes us wonder whether the downsides of quad-core technology in portables, including fat form factors and borked battery life, are really justified. As it goes, Intel seems to have smelled the coffee on this one, too. That, presumably, is why the cheapest Core i7 quad-core mobile chip is pegged just 10 per cent higher on the price list than fastest of the new dual-core Core i7 variants. Hardly a resounding vote of confidence in the self-evident superiority of quad-core, is it? Anyway, if any laptop can convince us of the merits of four cores and fully eight threads – don't forget about HyperThreading – in a portable PC, it's surely the G60J from Asus. Uniquely among our sextet it sports a Core i7 820QM, a quad-core processor that's second only to the stupidly overpriced 920XM in Intel's mobile hierarchy. Ostensibly, it's clocked at 1.73GHz, but thanks to Intel's auto-overclocking Turbo feature this chip can hit speeds just over 3GHz. That's the theory, anyway. In our testing, running heavily threaded software, such as video encoding results in a clockspeed of 2GHz. Even in single threaded benchmarks you'll see no more than 2.7GHz. That's significant, because the fastest Arrandale dualies run well in excess of 3GHz, even with all four threads on full reheat. The upshot of all this is that Intel's new dual-core i7 mobile chip is altogether too close for comfort in performance terms. Quad-core doubts aside, the G60J is an extremely polished bit of kit, just as you would expect from Asus. The chassis is a quality item, nicely screwed together, hewn from some pleasantly tactile plastics and finished with a few funky flourishes, including a subtly backlit keyboard – all the better for nocturnal frag fests. It's also tolerably compact for a powerful 16.5-inch laptop PC. Moving on to gaming performance, the G60J shares its NVIDIA GeForce GTX 260M graphics chip with the Alienware M15x. The 260M is one rung down from NVIDIA's top mobile GPU, mustering 112 stream processors to the 285M's 128, and delivers solid, if not spectacular performance in most games. Still, it's enough to ensure only the Alienware is faster and even then only just. It's all looking good for the G60J, then? Not quite. Apart from the wallet-wilting £1,700 sticker, the G60J's greatest weakness is its 16.5-inch LCD panel. The 1,366 x 768 native resolution is pretty mean, even if it does ensure that the GPU has less work to do when driving it natively. But that certainly doesn't make up for the awful viewing angles, the resulting watery colours and feeble contrast. At this price point, that's borderline unforgivable.